The shock appearance of an Antarctic SW broadcaster hit the DX world in July 1974. New Zealand DXer, Dene Lynneberg was the first to positively identify their weak and fluttery signals on 6012 kHz, and in subsequent months AFAN was heard as far away as the eastern USA. Dene, while band scanning at Quartz Hill on the evening of 21 July detected a weak signal with pop music and an American DJ on 6012 kHz. After consultation with Bryan Clark in Wellington who was also able to pick up the signal on his 680X, the possibility of it being CJCX was considered. The mystery was further unravelled – or confused – by the ID of “AF-AM, 100 on your dial”. This was clarified by a further announcement “Coming to you from McMurdo Sound, Antarctica.” The American Forces Antarctic Network had been logged! The signal was weak but steady and a continuous recording of the station was made up to 1030 GMT. Verification of this catch was vital. This text suggested that transmissions may be irregular. The station was noted again on the three following nights from as early as 0400 GMT but suffered interference from VOA Greenville 6015 kHz between 0600 and 0800 except on Sundays when the VOA does not sign on until 0730. Radio America, Peru on 6011 dominated the frequency in the next few weeks. 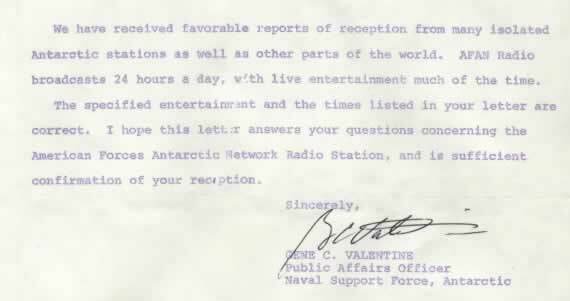 The 24 hour broadcasts provided isolated Antarctic research stations with continuous radio entertainment. News hit the New Zealand DX community by way of the August “DX Times” and created terrific enthusiasm. Attempts to log AFAN were high on everyone’s priority and many hours were spent waiting for an opportunity to hear AFAN through the interference. It was tough going though every now and then, Radio America would not be on the air and reception of AFAN was reasonably easy. Reception reports were sent to the Public Affairs Office in San Francisco and QSLs were soon forth-coming. 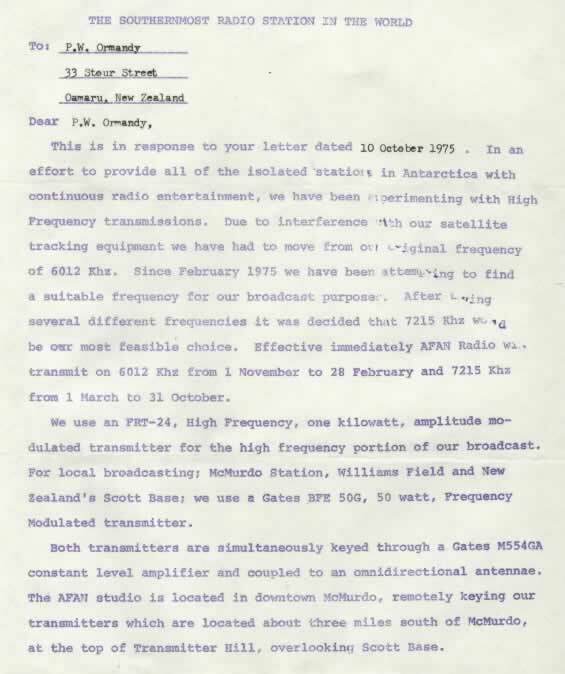 In April 1975, a change of frequency was noted by Paul Aronsen of Invercargill. Paul heard them on 7050 kHz between 0615 and 0900 GMT on 28 April at poor level, though transmission on this frequency was short-lived as AFAN searched for a new channel as this broadcast was apparently part of a test to determine seasonal frequencies. The 41 meter-band frequency finally chosen for the period March 1st to October 31st was 7215kHz which was also widely heard, with 6012 being used for the rest of the year. AFAN appeared to only use the 41mb channel for one season as subsequent seasons revealed signals on 6012 only. Both frequencies were targeted by DXers world-wide and offered sporadic reception. AFAN increased it’s number of 50 watt FM stations and SW reception became even more sporadic. In the mid-’90s, a cable TV system was added to McMurdo’s broadcasting capabilities. As the years went by, fewer and fewer reports of reception surfaced and there was speculation that AFAN’s SW operation was no more. Every now and then, a logging popped up in the DX media to give us all hope, however DXers fears that AFAN’s shortwave operation had been axed were confirmed in 1991 with reports from McMurdo that the transmitter was not being used. In 1991, AFAN reported that they were waiting for new equipment to arrive an planned to reactivate by late February ’92. This didn’t eventuate and neither did a heralded update in February 1993 which indicated a plan to be back on SW by the end of December the same year. The final nail in the coffin came in 1995 when the SW transmitter was returned to the USA. Thanks to Bryan Clark, Chief Editor of the DX Times for much of the above story. Dear friends of the American Forces Antarctic Network, I am Valter Ik7tab om, passionate about Broadcasting, I am a SWL / BCL, I found your Website, I find it interesting bike. I do not know if you have your radio still active. I am interested in DX in all its forms. I inform you that I am in contact with Argentina Antarctic station LRA 36 but not only but I am in contact with the Base Bove Antarctica founded by Renato Cepparo I1sr as the first base in Antarctica and with Julius Fabri Iv3cct with special name II3BOVE ON AIR. I am in charge of the Association Radioamatori & Freeband – Link: http://www.radiantismo6.webnode.it. I ask you if you would like to collaborate with our association. Thanks again and I look forward to your response. 73 de Valter Ik7tab. Hoping this gets to you. military who wrote and signed it. 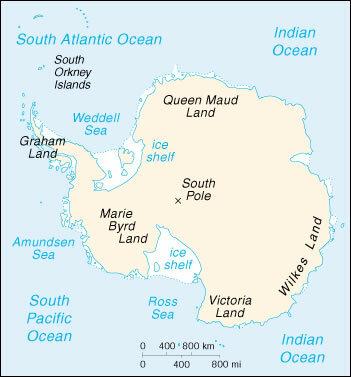 Sorry to read AFRTS is no longer active in Antarctica. During that time we broadcast on two FM stations, one Television station and 6012 kHz shortwave. During the 4 seasons I was stationed there, AFRTS was using a military 10,000 watt HF radio transmitter, and I usually filled out between 40-60 QSLs a month from all over the world. If you tried tho get us, we had a good signal in the northern hemisphere. (especially in the early mornings) Our programming was mostly AOR, a little Jazz & Progressive Rock with old Radio Drama & CBS Mystery Theater in the evenings. All my Ham buddies with good antenna’s in the USA and Europe heard us with no difficulty during those years. New Zealand may have been a little to close and under the skip. Not to many Kiwi’s DXers requested QSLs during my tenure as Chief Engineer. Thanks for the article, even if it is sad news.